This title has come to represent not only the best in the public works profession but those natural leaders who have dedicated a lifetime to sustaining the structures that form the foundation of our communities. 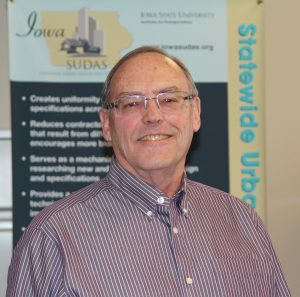 Paul Wiegand, the program director of the Iowa Statewide Urban Design and Specifications (SUDAS) program at Iowa State University’s Institute for Transportation, is no exception. Wiegand has always had roots in Iowa. Looking back to 1972, when he first began his career as an assistant to the city engineer in Charles City, Iowa, Wiegand was hands-on, completing field surveys, drafting, and design of street and utility projects. Paul spent the majority of his public works career working for the City of Ames as staff engineer, traffic engineer, municipal engineer, and the final 17 years as public works director. Today, he is responsible for directing the activities of the SUDAS program, which provides uniform design guidelines and construction specifications for Iowa’s urban public improvement projects. Iowa is the only state to develop and implement uniform urban design standards and construction specifications that are used statewide. Wiegand is the third and longest serving SUDAS director. Wiegand called this honor “a very humbling experience” as it validates all the long hours and hard work put in through the years. “My interaction with Paul came in the 16 years I served on the City Council. During his tenure with the City of Ames, Paul’s ability to lead one of the largest departments in the city, and certainly the most diverse, was outstanding,” she said. Because of his ability to communicate with citizens, contractors, and developers, the Public Works Department at this time was able to accomplish several large infrastructure projects to support the vibrant and growing community, which included the 5.5-mile sanitary sewer outfall project, the Bloomington Road water tower project, and the Ada Hayden Heritage Park project. And for Wiegand, this and similar accomplishes rank among his proudest moments as a public works leader. Since Wiegand joined the American Public Works Association in 1979, he has been actively involved with the Iowa Chapter and is now a lifetime APWA member. “Paul’s experience and knowledge has strengthened and influenced the Iowa Chapter’s success,” said David McDermott, current APWA Iowa Chapter president. McDermott described Paul as a true leader who has continually stepped up to mentor others. Throughout his career, Wiegand has been known to impart bits of advice to others aspiring to be excellent public works professionals and who strive to serve their community well. His advice comes from over 40 years of experience in the field. Wiegand will be presented with the Top Ten Public Works Leaders of the Year award at a reception in Ames on May 18. An additional presentation will be held during the National APWA meeting in August in Minneapolis, Minnesota.